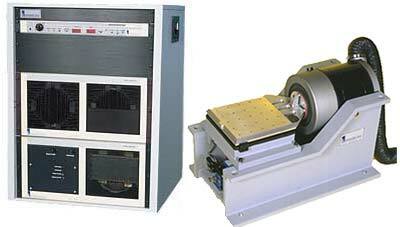 The LW-127-500D12 is the largest of the current family of Labworks vibration test systems. Its large 12 inch Square oil film Slip Table mounting surface provides high load and off-center moment capability for applications where heavy or large loads are to be tested. The DB-127 also allows the ET-127 shaker to be uncoupled from the slip table and rotated into its vertical position allowing normal vertical testing of smaller components directly on the shakers armature. The Shakers internal high lateral stiffness carbon composite armature suspension reduces problems associated with off-center loads when operating vertically. The ET-127 Shaker in this system is equipped with a degauss coil to ensure low stray magnetic field for sensitive applications. The modular air cooled PA-123 amplifier is direct coupled to the shaker to give the maximum performance at low and high frequencies. Digital meters display the system operating levels and complete shaker and user interlocks help protect the system from accidental abuse.